Both browsers are good. Does one edge out the other? The two most popular desktop browsers, Google Chrome and Mozilla Firefox, have been competing for years. 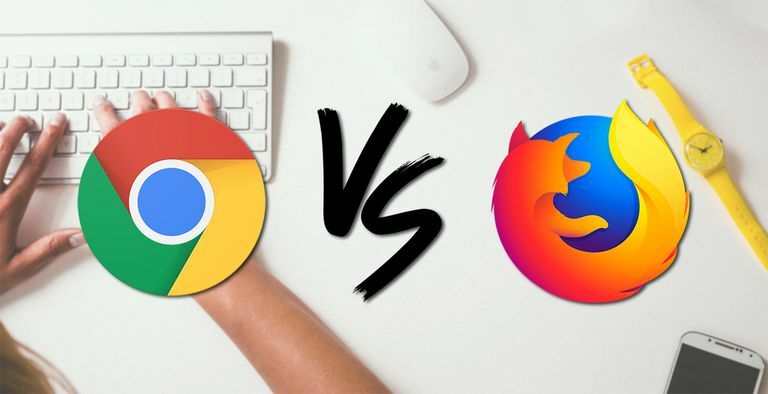 With the release of Firefox's Quantum browser engine, has Mozilla finally dethroned Google Chrome? We'll examine that question closely below. This comparison was performed between Chrome 69 and Firefox 62 on both macOS 10.14 and Windows 10 version 1809, the most up-to-date releases at the time of this writing. Synthetic benchmarks have long been used to evaluate how browsers stack up against one another. They're great because they're objective and clear, but are far from a perfect representation of a browser's capability. In evaluating a variety of benchmarks, Chrome is the clear victor, as shown in the above image. Sometimes, it was by only a few percentage points. Other times, such as with MotionMark, the results were outrageously different. Load times are important, but perhaps not as important as rendering web pages accurately, meaning pages look like they're supposed to when visited. For modern browsers, this is effectively a non-issue. Regardless of the browser you choose, websites appear consistent. But in edge cases, differences can sometimes sneak through the cracks. In those cases, Firefox will sometimes render a webpage inaccurately. While it's rarely a usability-busting error, sometimes it can break the website. Opening the page in Chrome is typically the solution to this bug. While this will likely only affect one to two web pages a month, it's still a problem; we shouldn't need to try multiple browsers to ensure a website is loading properly. The web exists because of web standards: technologies set out by the World Wide Web Consortium (W3C) to define how the web should be coded and interpreted. These standards allow for interoperability and cross-compatibility between all the servers and web browsers in the world. Without a clear standards body like W3C, the web couldn't work properly. Because web standards are so important to the proper functioning of the internet, browsers need to support as many of the standards as is reasonably possible. And the faster a browser can adopt new standards, the faster they can be implemented by developers and enjoyed by users. Firefox supports 488 web standards out of the 555 standards tested by HTML5Test.com, while Chrome supports 528 standards. It's an objective win for Chrome, but it doesn't translate into much of a difference in practical use. Browser history can be shockingly revealing and Google also has the power to capture more than just that; they can see what links you clicked and what links you didn't, carefully analyzing the effectiveness of various web elements and advertisements. Firefox has no such collection mechanisms. Your Firefox browsing history is private. Mozilla, the company behind Firefox, is a non-profit organization with the goal of protecting the internet and the people who use it. They don't make money from user information, and they don't want or need it. It's not just about browsing history, though. It's also about built-in tools to keep you and your data secure and safe. Firefox includes active tracking protection built-in to the browser and automatically activated. Firefox is on the lookout for software that can track your internet use and is actively subverting it, well beyond what the Do Not Track list does. Chrome doesn't offer any such protection. Both Firefox and Chrome have large extension libraries. These browser-based software packages extend the browser's functionality, and make up a major part of the modern browser infrastructure. Extensions include tools like ad blockers, video downloading software, password managers, VPNs, and more. Both browsers have access to broad libraries of extensions built by users and developers and are available for free. While there might be quantitative differences between Chrome extensions and Firefox extensions, the qualitative difference is essentially the same. Chrome has a slight edge here because of its usage rate. It's easily the most popular desktop browser on the market. As a result, extension developers would be smart to concentrate their development resources on Chrome, meaning extensions sometimes only exist in Chrome and are unavailable in Firefox. However, Firefox scores by including incredibly deep options for customization. Firefox Color, for example, provides a graphical interface to change your browser's color, so users can effortlessly build their own themes. There's more beyond Firefox Colors, too; power users can write CSS code to customize how the browser itself appears. If you have the time and inclination, you can make Firefox look however you like. In the end, both browsers are basically tied. Chrome has a slight edge in users who want to plug and play, while Firefox has perks for people who love turning knobs and fiddling with settings. A capable browser can't do much good if it's difficult to use. The user interface, or the layout of the browser, determines how easy it is to use. Small changes can make big differences. Chrome and Firefox follow the same broad layout. However, Chrome manages to be easier to use, while Firefox offers significantly more options for customization, complicating the user interface. Menus can be confusingly organized in Firefox, while Chrome tends to shoot right to the point. Google's Material Design language is also apparent in Chrome, and it shines. It's a legible, clear method of layout, and, even with the Photon design language, Firefox doesn't have the same consistency. It's also easier to manipulate Chrome's user interface. Buttons and extension icons can be dragged around Chrome's toolbars without entering Firefox's customize mode. Not all browsers are created equally, meaning they don't always ship with the same or comparable features as their competition. Firefox includes excellent tracking protection. You'll also find a reader mode, which dumps all the ads and layout elements on a page, presenting you with only the clean text, attractively rendered. A similar experience in Chrome requires an extension. Firefox also ships with Pocket integration so you can save articles for later. Users of Pocket can quickly save articles, but they're not the only ones that benefit. Firefox can also recommend popular posts in the New Tab page. While it can be disabled, it's a great resource for keeping up with the news of the day. The mobile version of Firefox also has a web page night mode feature that changes white backgrounds and black text of the web into night-friendly colors. Firefox on desktop also includes built-in support for web screenshots. You can capture the full scrollable length of a webpage with the included tools, something that requires an extension on Chrome. Chrome provides some unique features of its own. Support for multiple users is the biggest one. User profiles in Chrome separate browsing history, extensions, appearance, and more into distinct silos, making it easier to share the browser on shared computers, as well as allows users to sort their browsing habits into buckets and improve their online experience. Firefox does offer something similar with Containers, which separate browsing data. Multi-user support does technically exist in Firefox, but it's hard to find and harder to use, not to mention less useful. Cross-browser syncing of data is available on both platforms, but Chrome's implementation is superior. Log in with your Google account, and your browser settings, history, cookies, and extensions are shared with every other Chrome instance using your login. Firefox can sync data between browsers as well, but it's not as robust or simple. We can't forget about Chromecast either. Chrome users can "cast" a webpage to their Chromecast, seamlessly transferring a video from their computer or laptop to their television. Firefox includes nothing even approaching this. In the aggregate, Firefox's features make it a better fit for reading online. Chrome's features are better for multi-user and multi-device support. For most people, Google Chrome is clearly the superior web browser. If you're concerned about privacy, Firefox is the superior pick. Otherwise, Chrome still handily surpasses Firefox in nearly every measurable category.